The Nokia C2-02, the dual-SIM Nokia C2-03 and the freshly colored Nokia C2-06, the new additions to Nokia's C2 lineup, have so much in common you'd hardly tell them apart. But it's the features in these hybrid touch-and-type devices that matter, and that's why the Nokia C2-03 takes center stage with its dual-SIM functionality. The C2-03 is a dual-band 900/1800 MHz handset coming with an Easy Swap SIM slot on the left side of the phone allowing you to quickly change SIM cards without having to remove the battery first. In addition, now you can also get Nokia Maps on Series 40 with offline maps, all for free. Thirdly, the phone will ship with a reworked Nokia Browser squeezing data before it reaches your device for quicker browsing speeds. The Nokia C2-03 features a 2.6-inch display with a resolution of 240x320 pixels with 65k colors. It also comes with a 2-megapixel camera and 10MB of internal memory expandable to 32 gigs via microSD cards. At the same time, the C2-03 packs a capable battery providing you with up to 5 hours of talk time and nearly 400 hours in standby mode. The dimensions of the handset are 4.05 x 2.02 x 0.67” (103 x 51.4 x 17mm) and it tips the scales at 4.16oz (118g). 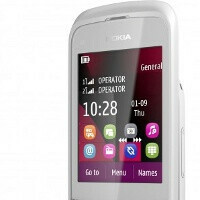 The Nokia C2-03 price is set at $110 (77 euro), but it might vary in India, China, SEAP, Eurasia and MEA, the markets for this device. The other two of the crew are nearly identical: the Nokia C2-02 is the single SIM version with a similar feature set, but also push messaging options and included IM providers, while the Nokia C2-06 brings a set of fresh colors with a clean, smooth finish.